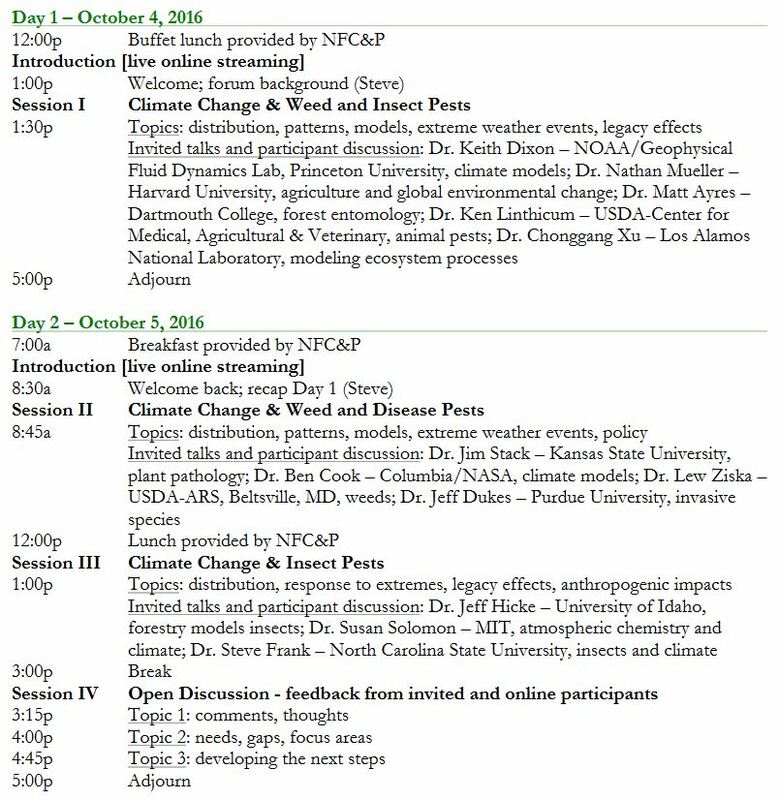 Next week in Washington DC and streamed online, The National Forum on Climate and Pests on October 4–6, 2016 will bring invited experts together in front of a live Internet audience to speak about the latest climate change science and pest research. What can studies about climate tell us? What will these changes mean for homeowners, forestry, and agriculture? These questions (and more) will guide the dialogue of the forum. The forum will discuss commonalities, identify gaps in knowledge, and initiate strategic planning. You can participate in this forum online October 4 and 5. For more information, please see the National Forum on Climate and Pests website (http://neipmc.org/go/nfcp) and the program agenda. Join the email list to get the online link to the live streaming event, which starts at 1:00 pm (EST) on Tuesday, October 4 and continues Wednesday, October 5. This event is being organized by the Northeastern IPM Center in cooperation with Regional IPM Centers, National Research Council of the National Academy of Sciences, Regional Climate Hubs, the American Society of Agronomy, and the Cornell Institute for Climate Change and Agriculture, with funding from the USDA National Institute for Food and Agriculture (NIFA). This entry was posted in news on September 29, 2016 by jec3@cornell.edu.